Today, we will be covering the remaining three characters of Never7: Kurumi Morino, Izumi Morino, and Okuhiko Iida. Izumi’s younger sister who, despite looking and acting like she’s in middle school, is actually 17 years old. Kurumi is full of boundless energy and cheer, always indulging in eccentric antics due to her love for the bizarre, and can act seemingly childish at times. However, deep down lies a very lonely and insecure young woman who acts cheery to escape her anxieties. When she was a baby, she was kidnapped and vanished for three years, only to be found in the Shiki no Mori shrine still looking the same she did three years before, and developed a large scar on her back from the incident. With her being ostracized from her first crush due to her scar and her family hiding the reason for her scar, Kurumi feels left out, yet doesn’t want to doubt her family. Afraid of being ostracized again, she avoids any situations where people would see her bare back. Because of this, including her parents being busy with work most of the time, leaves Kurumi just wanting to have a normal life like anyone else; to fall in love, get married, have kids, and do normal family activities with them. When the truth behind her past comes out, Kurumi feels betrayed and runs off, but Makoto reaches out to her and convinces her of her place in the hearts of her family, and in other routes, rekindles strong bonds with her sisters, Izumi and Haruka. Kurumi is aware of the special treatment she gets from her family, wondering if they’re hiding something from her. Her love of the occult can be seen as a sign of rebellion against her scientific parents, but she doesn’t want to doubt them, feeling she’s not the kind of person they’d keep secrets from, and her innocent personality is an act, unconscious representation of her desire for people not to keep secrets from her. 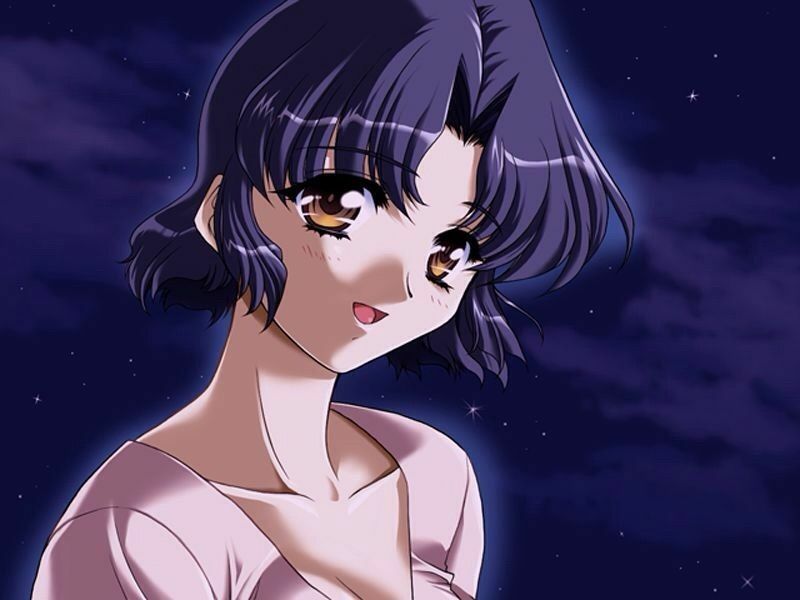 In Haruka’s Route, while she doesn’t end up learning the connection between her and Haruka, she may have suspected they had a connection due to her intuition. Kurumi is the type who is adaptable, and so is quick to accept anything that happens before her, such as the truth behind her and Makoto’s time travel. The kind and motherly temporary manager of Lunabeach, a restaurant situated on the local Moon Beach, Izumi is Kurumi’s older sister who rarely breaks her gentle aura. In truth, however, Izumi is in fact a teacher at Makoto’s college and the brains behind the Seminar Camp, having set it up as a counterproof experiment of the phenomenon known as Cure Syndrome. After learning from her parents the truth of Kurumi’s kidnapping and subsequent disappearance, Izumi strove to discover the truth behind the incident and investigated the island many times to no avail. Skipping several grades and graduating young, Izumi became familiar with Cure Syndrome around the time she became a teacher. Her logical side rejected the hypothesis as unscientific, but in her heart, wanted to believe it could be true so she could erase Kurumi’s kidnapping from history so the tragedy would never happen. Unfortunately, she also has a very bad habit of refusing to reveal secrets until the worst possible times, leading to tragedy in Kurumi’s Route and her own, because she is afraid of how Kurumi will react if she hears the truth. However, in the Cure A ending, Makoto convinces her that she’s being selfish and Haruka and Kurumi deserve to know the truth. Once she does, the sisters all reconcile and form newfound yet strong bonds with each other. Much like her sisters, Izumi expresses a love of water. Water was chosen to be a shared like between them because it has a pleasant image, and likened the image of beautiful sisterly love to how though water can change into all sorts of forms, such as ice and water vapor, its true nature stays the same no matter what form it’s in, much like how the Morino sisters developed differently yet share that point. Izumi unconsciously believes that if she doesn’t know the truth, it’s mentally healthier to come up with a solution for it so she doesn’t have to think of anything unpleasant, meaning she is impassive from an objective standpoint. Her statement of “Regulus is continuing to shine, even now,” is made because she believes what she sees in front of her is truly reality.